Essence's Model Rocketry Reviews, in cooperation with G-Wiz partners, is pleased to announce a new photo contest. The prize is a G-Wiz LC Flight Computer! Read below to understand the requirements. Entries will be judged by EMRR Guests during a voting week of April 23 - 27. Contest is over on 4/22/2001. Online Voting will take place from 4/23 - 4/27. The series of photos below are pictures from my dad's Level 1 certification flight. 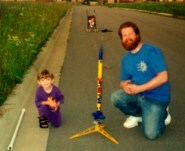 Since, this was my dad's first large rocket I gave him pointer's and made sure he didn't make any mistakes. 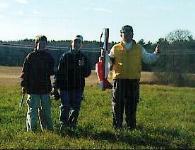 The rocket turned out well and was flown on an H128 for a successful certification flight with CMASS. It's my buddy Martin with his 2 boys Jason and Garrett. The other boy is my friend Delores's son Sean. It was an Estes starter set that I got him for Christmas a few years ago that brought me back into rocketry after a long hiatus. 1) NWARS charter member Chris Abel, his son Alexander Abel, my son Stuart Morley, and landowner Craig Brown out for a fun afternoon of launching. Not pictured Ellen and Leslie Brown who were out searching for an Astron Sprint clone. 2) Cindy and Stuart Morley launch an Estes Mark II older than either of them. I managed to capture my usual launch photo. Note Steve Bennett inspired headgear. 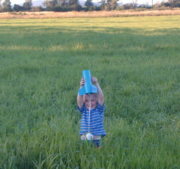 (No really, he'd just seen the Starchaser "launch" on TV and wanted to wear his "plastic hat like the TV rocket guys".) 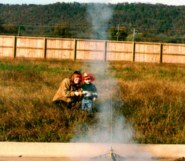 3) Me and my son Stuart launching a Maniac on an E-15 (AT) as it was designed to do. My son Chris Morley is asleep in the stroller in the background. You can't start too early. I didn't know that Stuart had struck the same pose I had until the pictures were developed. The pictures were taken at a Beaver camp held in May 1999, in Calgary, Alberta. My son Alex and I were asked to organise a building session and launch. For those of you who are not familiar with Scouts Canada, Beavers are the "entry" level into the program and the kids in Beavers range in age from five to seven. The youth built Gnomes, Vikings and Alphas. We started building at about 11:00 am and were finished by 12:30, including painting. The Leaders brought some spray paint in a variety of colours. The kids picked the colours they wanted and some volunteer parents did the spraying. 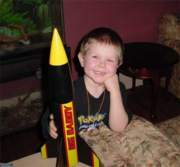 The kids also had markers and stickers in their "Beaver Buckets" and a number of them customised their rockets. With Alex acting as LCO (and loving every minute of the "lime-light") and Colony Leader recording the Beavers' names, rocket type, and motor type, we held a very successful launch. Just before we started, I reminded the kids that model rockets do get lost, or caught in trees, or sometimes even crash - they shouldn't fly if they weren't prepared for these to happen. Of course, everybody wanted to fly. After the first demo launch, everyone was hooked! The flight stats showed we lost only 2 rockets of the 25 flown. 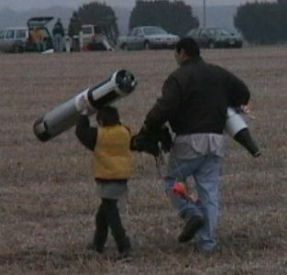 Entry #5 - Tony Alcocer "the proud father"
Here's some photos from our club's recent public outreach event. We had a public build session at the Austin Children's Museum with Rocket Boy Quint Wilson on hand to sign autographs and talk with visitors. The first picture is the chaos of the rocket building room - wasn't really as wild as it looks in the picture. 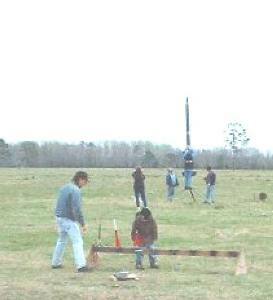 About 70 rockets were build that day by parent-child teams. The second picture shows Quint Wilson autographing a copy of Sport Rocketry from a supply we received from NAR HQ (thanks!). 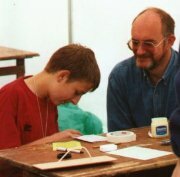 The third picture shows then Treasurer James Duffy guiding one of the builders through a tricky part of assembly. They are all from my son's summer camp, the Camp Curiosity, where Todd and Drew Ritter teach the kids about rockets and how to safely sent them up. 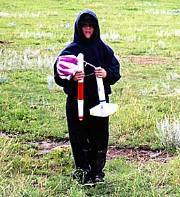 After an inspection by Todd and Drew all the kids are permitted to launch their own rockets. 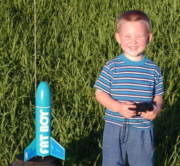 For the kids who do not have their own they will fire the launch button for the rockets that Todd and Drew have built. 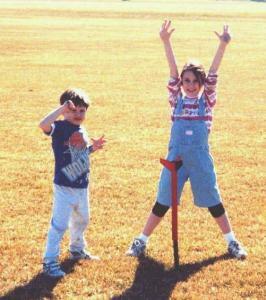 Every kid gets the thrill of the launch. 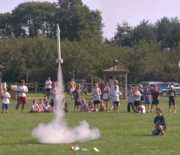 The Rocket Club enjoyed well over 200 safe flights this summer. 1) Wes flies the Launch Pad Gecko rocket he helped build as Todd (in the red shorts) keeps everyone back a safe distance. 2) It took some time to figure out what this UFO was since we were using a sloooooow film. While it appears Wes is flying just a rocket engine he is actually launching the RTF flying saucer as Drew Ritter looks on. 3) Todd keeps an eye on the launch as Mike sends the Phoenix on its way. Here are some pics of my son (Shaun) prepping and recovering his UKRA L1 certification flight. He built and flew a PML Bullpuppy with Tango Papa decals on an Aerotech H128 reload, in a Dr Rocket RMS. 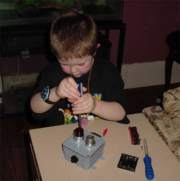 1) This is Shaun building the reload under supervision. 2) This is the look on his face after take off. Looks like he's discovered HPR :-) 3) Here he is with the Bullpuppy after a successful recovery. These three photos show me, Brian Wheeler, and my dad flying rockets over the past three years. 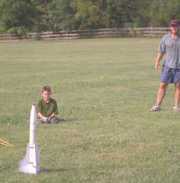 Photo 1 shows our first big launch, right when I was getting into mid-powered rocketry. 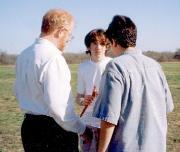 I was 13 when this picture was taken, and on the right is one of my friends who used to attend launches with me. 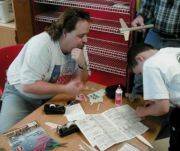 Photo 2 shows me and my dad last year, when I was 15, holding his level 2 project, a PML 1/2 scale Patriot that I helped him build. Photo 3 was at the launch where my dad got level 2, and in the picture, I am connecting the leads to one of my now small rockets, a Phantom 4000 on a G35. I am now 16, have gotten a couple friends into the hobby, and my current project is a 6 inch diameter carbon coated rocket that I will fly through my dad's certification on Kosdon L motors until I am 18, at which point I hope to get level three certified with it. It is 11 feet tall, has a Scotglas nose and tail cone, and will weigh around 30 pounds. It should be finished this summer. 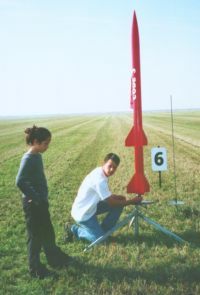 I write the club launch reports for the club launches around Texas, and have had one published on Wild Rocketry. I have been into rocketry since the summer after my thirteenth birthday, and aim on being an Aerospace Engineering major in college. Natalie and Madison were already in line at Springfest 2001 when I got into line. Dad stepped out of the way so I could snap the picture. Both girls' rockets flew well and recovered fine. They already know what they're doing, these two. 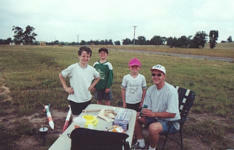 These are a variety of pics from our rocketry activities over the past couple of years. Photo 1 is of my Son, Curtis, on a cool blustery day with his Estes Python after recovery. 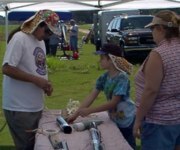 It was a rather cool weekend during our annual rocketry competition.... "but we just have to keep launching, dad". Photo 2 is on a much warmer, lazy, fall day. 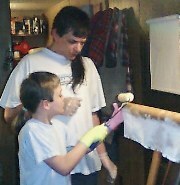 Here Matthew and Curtis help show off Dad's wares. Note the sign in the background, It is hard to read but is does say "A bad day at ROCKETRY is BETTER than a good day fishing." Photo 3 was a special day for a lot of kids when Julie Payette (Canadian Astronaut on shuttle mission STS-96) came to visit and talk to the group on what she does. In the Photo, junior club member, Alex Morgan is presenting Julie a plaque on behalf of his school classmates. This was taken at Whitakers, NC on March 25, 2001. The little guy and his dad at the front rack had a great time launching Estes stuff all day long. Here, they've just finished attaching the microclips to their Heatseeker while the guys in the background finish the prep on their next flight. I like the contrast, hence the file name "Start Small". The Family that flies Together stays Together AKA [real kids don't grow up they just get bigger toys] This picture is from RocStock 6/99 on the Lucerne Dry Lake in CA. I'm the colorful one with my level one cert attempt. My two kids JED and Krysta are in front. Jed with his Bumble Bee and Krysta with her Gnome. 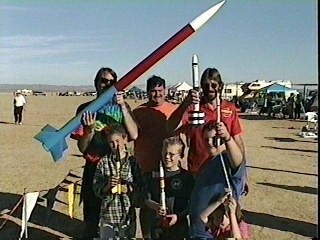 Also there was my brother [with the recycled Total TP tube fin rocket], his son, with another of Jed's Patriots and friend and son. 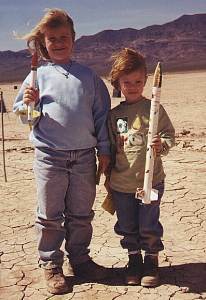 My two oldest daughters and I have fun being rocket scientists. 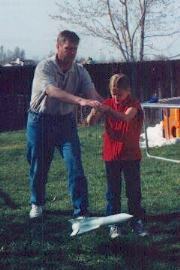 Photo 1 is my daughter Lisa (9) and me doing a string test on my new Launch Pad Phoenix. 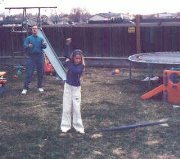 Photo 2 is of my daughters Lisa and Audrey before the first launch of Dad's Christmas present--a LOC Graduator. Everyone braved the Colorado winter to go to the CRASH (NAR 482) launch--spring was just too long to wait! Photo 3 is my daughter Audrey (10) doing a string test on her scratch-build "Comet"(in motion in the foreground). She designed the rocket and we built it together. Audrey took first place in her science fair project which explained: "How you build a rocket so that it will fly straight." The judges were a bit confused by the concept of the Center of Pressure, but Audrey--with her confident presentation skills--sold them that she fully understood what she was talking about. Mike Ash family walking back their big scratch-built Gemini after another flight. Entry by Drew Jenkins - 10 yrs old. 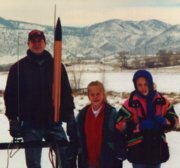 Some pictures of me and my family doing rockets together. 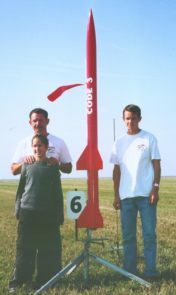 My Mom, Dad, and Sister fly rockets too! Pic.#1 In our shop 2001. I'm glassing an airframe for one of the scratch rockets I have built, note gloves on all hands. Pic.#2 Lilly Georgia 2000. I'm letting Dad help me prep Mom's "Pepsi Rocket" for another dual deployment flight while she watches, note GWiz Deluxe electronics we use. (Sister is napping:^) Pic. #3 Orangeburg South Carolina 2001. 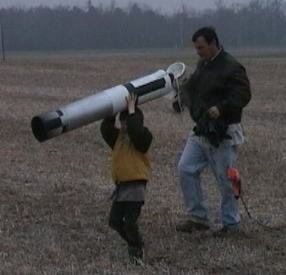 Me and Dad getting the igniter ready to go into a smokey K motor in "The Rock", we decided to use some thermalite, note Walston tracking unit taped on our rocket. I guess there is no rule that says I can't participate, so ... my son is already loving the hobby. He has taken "his" Fat Boy to pre-school for show and tell already to explain how it all works. Pic.#1 Ready, Dad, I have my camera so I can get a launch picture. 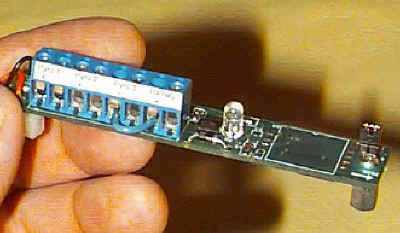 Pic.#2 Found it! "It's still smoking!" Pic. 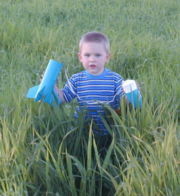 #3 I thought you said the grass was only knee deep . . . who's knees?! My son Sam is more interested in the construction of our projects than the flying, but don't get me wrong, he loves the flying too! 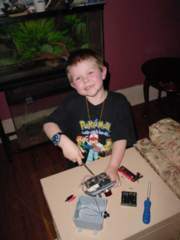 Sam is pictured making his own launch controller, as he thinks the one that came with the kit was "kind of crappy". It might kill him, but he is going to have to wait until the morning to try his new launch controller with his Big Daddy.